Underground Survival Bunkers – Good Idea or Bad? Underground bunkers can be very expensive and customized, or remarkably inexpensive made from converted shipping containers as shown here. Many people associate prepping with building a ‘Doomsday Bunker’ – some sort of reinforced concrete or steel bunker, and buried underground. These are sometimes primarily intended as nuclear and fallout shelters, but the companies building them come up with many other reasons and benefits to their underground bunkers, including tornado and storm shelters – but probably not flood shelters. In reality, such devices are a very small part – and often play no part at all – in most people’s prudent preparing for adverse future events. 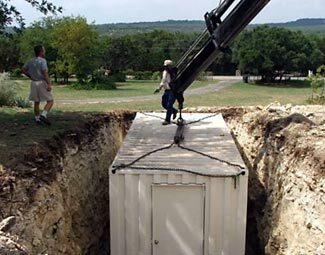 If you are considering some type of retreat or protective structure, should you consider an underground survival bunker? Let’s look at their pluses and minuses. A buried bunker with an obscured camouflaged entrance and low profile ventilation can be an excellent way to keep your retreat ‘off the radar’. In theory, marauders might be able to get very close to your bunker and not realize it is there. But in reality, there are some limitations to how obscure you can make your bunker. Unless you create an elaborate filtration system (which will require substantial ongoing filter supplies) the smells from cooking and perhaps from diesel generators will permeate out through the ventilation and particularly in a post-disaster world, which will typically have fewer man-made smells, may be noticed. And unless you never go in and out of your bunker, there will inevitably be tracks and a worn down pathway leading to the bunker entrance. So, yes, a bunker may be discreet, but it won’t be invisible. A great thing about a buried bunker is that you are surrounded with earth that is probably at a little changing moderate/cool temperature, year round. In the summer, the outside cool earth will help prevent your bunker from overheating without needing to use as much air conditioning (which is costly from an energy consumption point of view); in the winter, the earth, while still cool, may be much warmer than the outside air and ground temperature, reducing your need to heat your bunker, and again saving on energy. On the other hand, you’ll probably have absolutely zero natural light. Every lumen of lighting will have to be generated from electricity, you don’t get any ‘free’ daylight, unlike a regular above ground retreat. And to get fresh air, you can’t just open a window or two. Instead, you’ll need some type of active air circulation system which again uses energy (happily, not a lot of energy, but it is still an energy drain). And if your power should fail, you’ll only have a limited number of hours you can survive in the bunker before you need to evacuate due to lack of oxygen and build up of carbon monoxide and carbon dioxide. A bunker might conceivably use less energy for most normal activities, but it is more reliant on energy being always present. Most of an underground bunker is – by definition below ground. As little as a couple of feet of earth above the bunker will provide it with great protection against attackers. Even if marauders knew exactly which patch of ground was above your bunker structure, they couldn’t penetrate through its protective layer of dirt and its steel or concrete walls with regular rifle rounds. But if attackers found one of the limited entrance/exits to your bunker, they could attack that, or if not directly attacking that, they could use the location of the entrance/exit as a clue for the likely whereabouts of the bunker itself. They presumably could then simply get a shovel and dig down until reaching your bunker’s roof. At that point they could attack the roof with pickaxes or drills or whatever; while there’d be nothing you could do to stop them. After they have opened up even a small hole in your ceiling/roof, you will be at a massive tactical disadvantage. They can shoot blindly into your bunker, and the bullet ricochets will go everywhere, damaging possibly valuable and essential equipment and controls, and maybe harming you and the others in the bunker. But if you shoot blindly up out of the hole, your bullets will just pass harmlessly into the outside world and disappear into the distance. You might even miss the hole and create your own dangerous ricochets. Or the attackers could pour gasoline into your bunker then drop a match. Or simply fill your bunker full of water. Or run a hose from a vehicle exhaust pipe and gas you out. So while a bunker is resilient against short-term attack, it – and you all inside – are terribly vulnerable to a determined attack. There’s no denying that a below ground bunker is very resistant to above ground storms. If you need to have a special type of basement/cellar/bunker to protect against extreme storms above and beyond the protection your regular dwelling can provide, a bunker is a great consideration. Of course, storms are typically short in duration. If your underground bunker is nearby, it might be a convenient shelter. But if it is some hundreds of miles away, how often would you choose to go there to weather out a storm, compared to simply strengthening your main dwelling structure? The earth around and above your bunker provides an excellent shield against radioactivity subsequent to most types of radioactive events. If you wish to incorporate a fallout shelter feature into your retreat, a bunker is a great way to do that. The strength of a buried bunker can also protect against the destructive effects of nearby nuclear explosions, too – underground shelters can withstand massively greater over-pressure levels than can regular houses. On the other hand, unless you are living 24/7 in or immediately next to an underground bunker, the bombs might detonate around you without you even realizing they were on their way. And, if you survived that, the time it would take you to make your way, unprotected, to a remote fallout shelter location is such as to expose you to too much radiation as part of your travel to your shelter. You’d be better advised to urgently improvise a shelter wherever you were at the time the nuclear event occurred. A problem is that when you’re in ‘lockdown’ mode inside your bunker, you really don’t know what is happening above ground in your general vicinity. Fancier bunkers might have periscopes, and even fancier ones might have remote video cameras. Top of the line bunkers sometimes even have a remotely piloted drone with wireless video feed. But none of these are effective substitutes for the good old low tech ‘Mark 1 Human Eyeball’ and its ability to detect movement, and to combine visual and directional sound (and maybe even smell) cues to sense the presence of threats. Plus, the higher-tech the approach to monitoring the area, the more vulnerable it is, and the more exposed you become when it either fails naturally or is destroyed by an attacker. Remote piloted drones run out of gas and if you’re in your bunker, you can’t go out to retrieve it and refuel it. Video cameras can be shot out or simply have the wiring cut. Periscopes can have their lenses broken or obscured, and their mechanism jammed. Not only might you not know what is happening to and around your bunker, but even if you do know what is happening, there is very little you can do to influence what is being done. In addition to clear 360° vision showing you everything going on around your retreat, any well constructed above ground retreat would have overlapping fields of fire from protected positions within it, allowing you to defend your entire structure from attack, no matter where it was coming from. That’s just not possible if you’re six feet underground. In addition, an above ground structure should have a close-in ‘killing zone’ that you have erected to make attackers as vulnerable as possible the closer they get to your structure. But you can’t do anything like that for a bunker, because you’ve no way to direct firepower at attackers from your sealed bunker. Some bunker manufacturers talk about remote-controlled weaponry, and that seems like a great idea and excitingly high-tech. But the problem with any such weaponry is that it will run out of ammunition soon enough, and then how do you reload it while hunkered down in your bunker? Plus, while the weapons might be remote-controlled or even automatically activated, they can’t get up and move to a new position, like you’d do if you were out there yourself. Once an enemy has located the position of such devices, they can take their time and then carefully neutralize them with well placed shots. Your weapons will become sitting ducks and vulnerable once the initial element of surprise has worn off. There’s a more abstract issue as well. An imposing well defended above-ground building exudes power and confidence. An unsuccessfully obscured bunker signals weakness and retreat. Which do you think a typical marauder would prefer to attack? We’ll guess the bunker would be their choice, every time. This is a bigger deal than you might think. Most preppers seek to plan to survive a long-term challenge. Anyone can manage to exist in an underground bunker for a week or two, but what happens when the weeks become months become years? Aren’t you going to miss the sun? Indeed, you’ll find yourself craving not only the sun but the rain and every other type of weather, too. We’ve seen elaborate plans for underground bunkers that include areas labeled as intended to be used for growing food, and we’ve seen pictures of plants growing inside windowless rooms under strong lighting, designed to imply that you are seeing such a facility, in a bunker, successfully growing healthy abundant crops. The problem is that without the sun’s energy, you are having to use other scarce energy resources to replace the sun. Sunlight represents between 50 and 100 W of energy per square foot during the day, so if you are trying to duplicate 5 – 10 hours of sunlight a day, you could be required to burn about a gallon of diesel per square foot of growing space per week. If you have a single room measuring perhaps 40′ x 40′, that could be 1500 gallons of diesel every week to recreate the effect of the sun. Oh – and all that light and heat is probably going to make the room way too hot, because you won’t have fresh air and wind blowing through the room, so you’ll have to spend more energy to ventilate and cool the room. If you’re planning on a 100 day growing season, then you’re up for 21,000 gallons of diesel a year to enable you to grow food underground. And that 40′ x 40′ room, while seemingly big by ‘indoor’ standards, is only 1/25th of an acre. Yes, the sun really is that powerful. Now, okay, you could say ‘We’ll grow our crops normally in the fields and simply go back to our bunker to sleep each night’, but if that is your plan, and you’re going to be in the outdoors, in the open, all day every day, what is the point of the bunker for at night? If you’re more vulnerable while in it, and out of it as much as you would be with any other type of structure, how is the bunker actually helping your survivability? Why not settle for a more ‘normal’ and lower cost retreat building above ground. A bunker relies on more systems and equipment and processes than a regular above ground house. It needs 24/7 functional environmental management systems – maintaining your temperature (probably requiring cooling more than heating), maintaining the oxygen levels, the carbon monoxide and carbon dioxide levels, and the humidity (which would otherwise soar way too high). It needs 24/7 lighting. Even things like sanitation require pump assists to move water and sewer in and out of the bunker. The failure of any of these systems can quickly create a critical situation that would require you to evacuate the bunker until it was repaired/resolved. A bunker is a bit like a live-aboard boat. If you’ve ever owned a boat of 40′ or more in length, you know that you are always spending time and money on repairs and maintenance. It is a never-ending and expensive process. The same is inevitably true of a bunker, although with less salt corrosion and motion induced malfunction, a bunker would hopefully be somewhat more reliable. The need for repairs and replacements is okay when you can simply call up the appropriate repair service and have them come out with their specialist equipment and spare parts, but what happens after a social breakdown when the specialist technical support and the essential spare parts are no longer available? We’ll readily concede that you can build an underground bunker complex as huge as you may wish, as long as you have the funds to cover the skyrocketing costs of such a development. But most people, when choosing to build an underground bunker, are building something small, and having built it, are more or less locked in to the size that they have contracted for. An above ground retreat can be expanded more readily at any time, and can almost certainly be built at a lower cost per finished square foot right from the get go. Whether it is in the form of inviting more people into your retreat structure at the start, or having nearby neighbors you can see and wave to out your windows, or adding to your retreat subsequently to fit more people in, an above ground retreat can more readily allow for a larger population of fellow preppers to share the burdens of surviving in a Level 2/3 situation. There is safety and security and strength in numbers. You want to create or join as large a survival community as possible. That’s much more readily done above ground than below ground. A bunker can be used to protect against short-term external threats, but is only useful if you can get to the bunker prior to the onset of the threat. Many short-term threats may not have sufficient notice to enable you to get safely to your bunker prior to the threat occurring. A bunker is not a valid option as somewhere to live and survive, in an extended Level 2 or 3 type situation. It is very hard to defend a bunker against marauding attackers, and bunkers are likely to be greatly more maintenance intensive, something that would become increasingly a problem as your spare parts get used up. If you are adding a bunker to your in-city dwelling, you need to have a strategy in place for when and how you will be able to exit your bunker and evacuate the city. You’ll literally be stuck like rats in a trap in the potentially apocalyptic and lawless conditions that may prevail in a city after a massive societal collapse. And whereas, if you were simply planning to abandon the city at the first sign of a problem, which would mean you hopefully get away from dangerous population concentrations before the situation becomes dire; your decision to stay in your bunker for the first phase of the social collapse makes your subsequent evacuation very much more hazardous and difficult. By all means incorporate defenses against fallout into an above-ground retreat, and maybe even include a bunker as part of your overall retreat. But we suggest, for the majority of people, your most viable and defendable solution will be a well-built above-ground retreat, ideally as part of a community of like-minded folk (such as our own Code Green community). Many websites will sell you a very expensive (and very extensive) underground bunker – for example, here. But there’s a much lower cost solution if you must have a bunker, but would prefer one at a more affordable price (leaving you more money to allocate towards your above ground retreat). Get one – or more than one – used shipping container and use that as a basic space for your underground shelter. With the US importing so much more than it exports, and it being cheaper to sell containers rather than ship them back to China, there is a glut of low-cost shipping containers. They come in standard sizes, and are approximately 8′ wide and 8′ high, and either 20′ or 40′ long (larger sizes are also made but they are less common and not so good value). The 20′ containers typically cost $2000 or slightly more, and the 40′ containers cost only another $500 or so extra. They can be purchased on eBay and many other places. A single 40′ container gives you almost 320 sq ft of space (similar to a reasonably spacious hotel room). This would be adequate for a couple for a short-term, and cramped but acceptable for more people. In addition to adding extra containers, end on end, or in other one level layouts, you could also take advantage of their stackability and create a two or three or more level underground retreat. Here’s a webpage with a short video showing how one person created their own underground wine cellar from a shipping container. The same steps would be used to repurpose the container as a shelter/bunker instead.